Somehow Target still manages to get better and better each year. 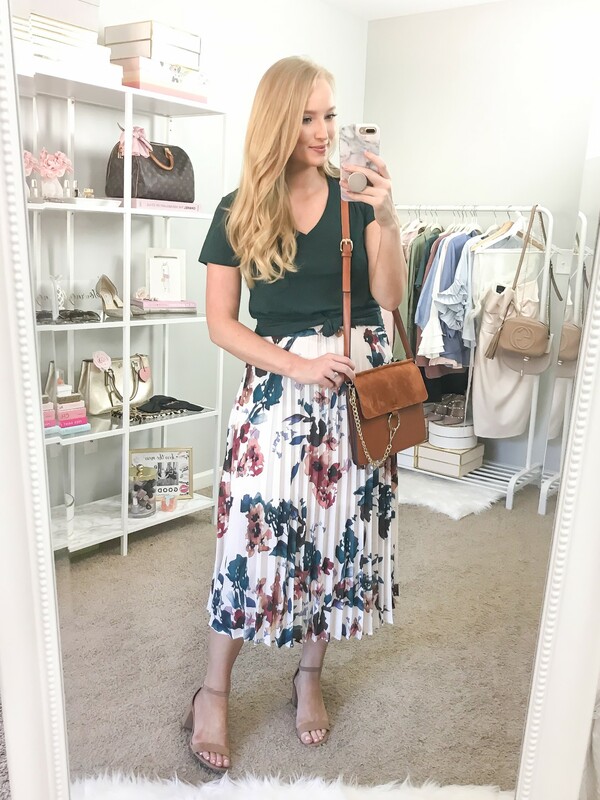 I love their revamped clothing lines and found great Fall staples online. 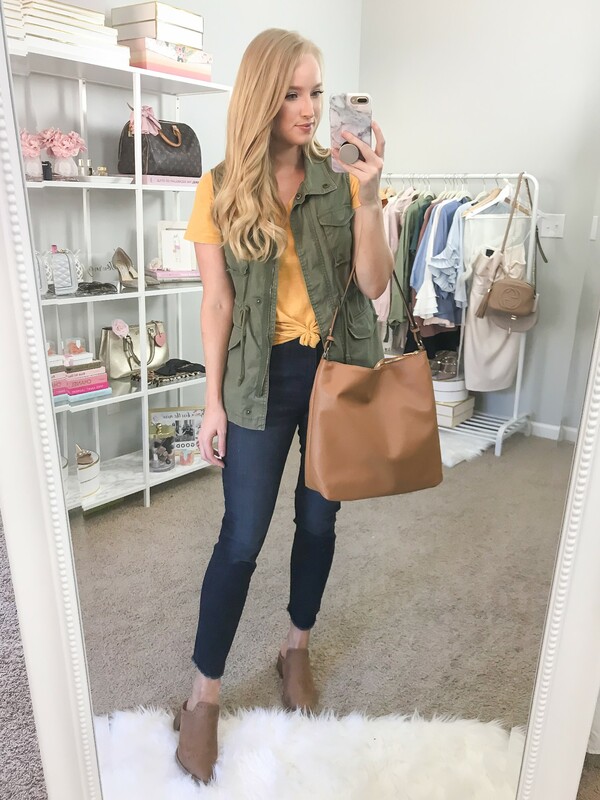 Today, I’m trying everything on with you and sharing affordable Fall outfit inspiration. If you’re coming over from Youtube, welcome to my blog! Here are all the items featured in my try on haul. I love the neutral stripes of this romper, but for a few reason I’m returning it. I’m not a fan of the tied waist belt, it wrapped around me 2.5 times. I hid it with this brown braided belt. The bottom is also thin and see through so pick your undergarments wisely. I styled it here to give you an idea on how to transition your rompers to Fall. My booties are a tall blocked heel and I recommend sizing up a half-size. 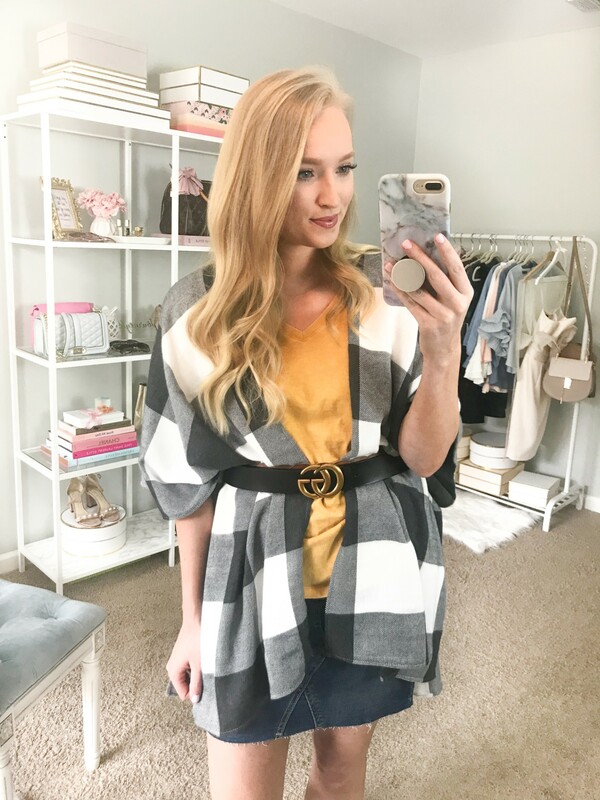 This cardigan is a dupe for the popular BP cardigan from the NSALE. The material is thinner and the sleeves are bulky, but I like it with the sleeves rolled up! It comes in a lot of colors online. I think I want to exchange this one for a navy or rust color because I have too many gray cardigans. Underneath I have a basic muscle tank that runs large. My booties are featured in my Amazon Fall haul but are unfortunately sold out in the gray. 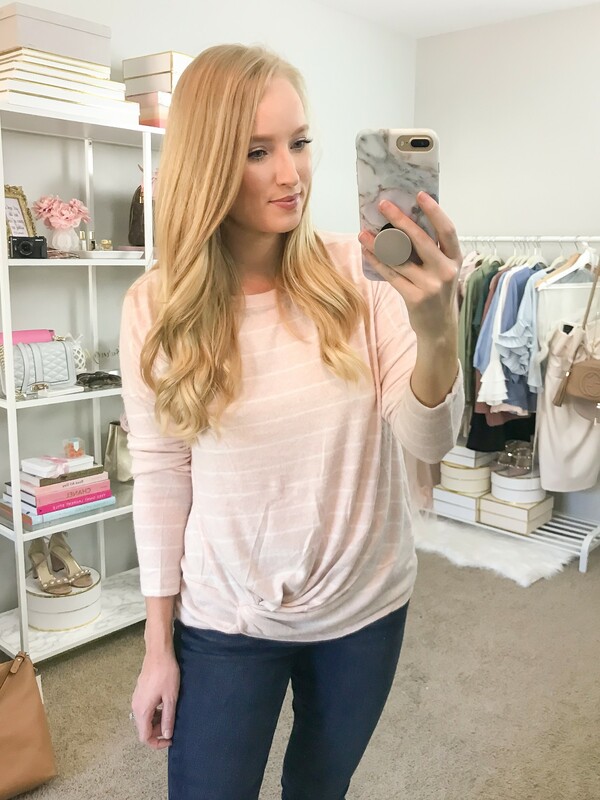 This cozy pullover top is a must have for Fall! I’m not kidding, it has 43 5 star reviews online. 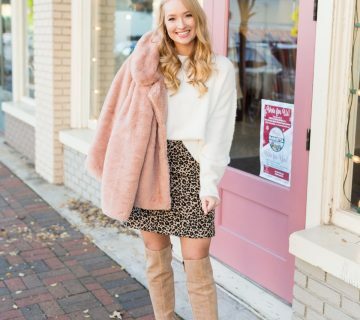 I know you hear this a lot when it comes to Fall fashion, but this is seriously the softest material! I sized up to a medium for a casual fit. I love pairing striped prints with leopard in the Fall. Here I’m wearing a cheetah slide from Nordstrom. Target has a similar pair from the same designer. I’m just not a fan of espadrilles so I went with the nicer quality. This top is the same material as the one above but has a knotted waist detail. 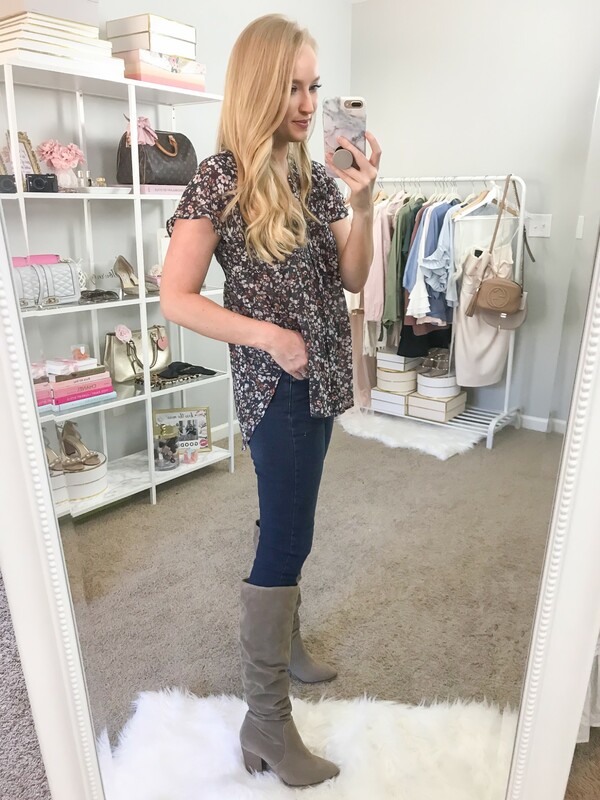 If you’re looking for a tall scrunched boot, these boots are a great option. 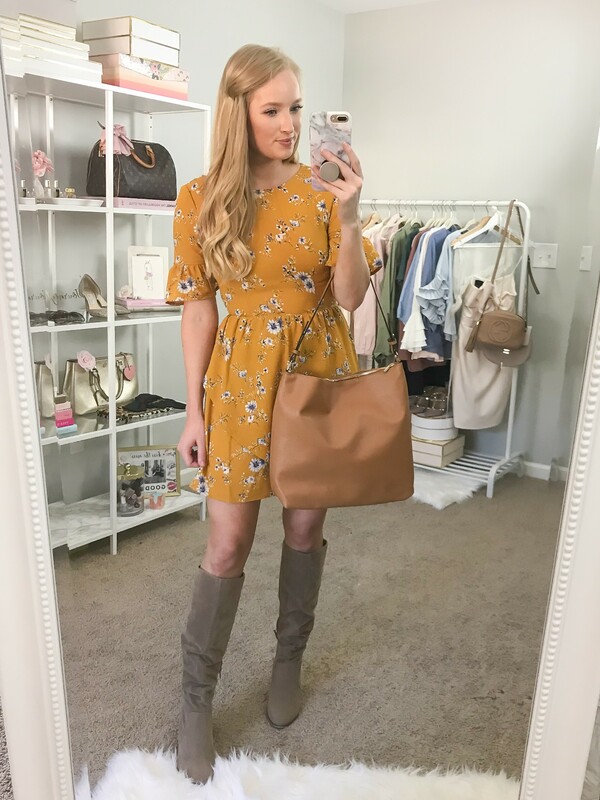 I love tall boots to transition dresses well into the Fall season. This pair comes in 3 colors: black, taupe, and cognac. Size up a half-size for more room in the narrowed toe box. 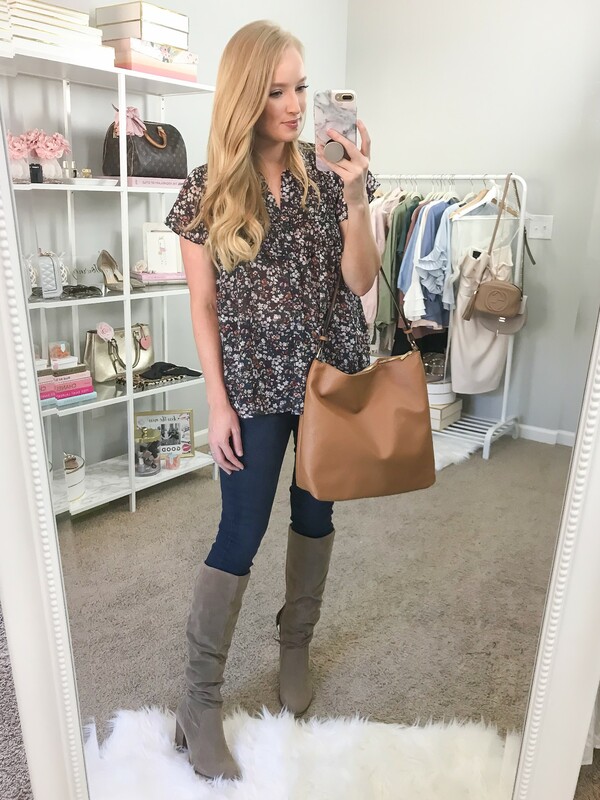 This floral top is a must have! It has a flattering fit with the smocked detail and I love the flutter sleeves and length in the back. 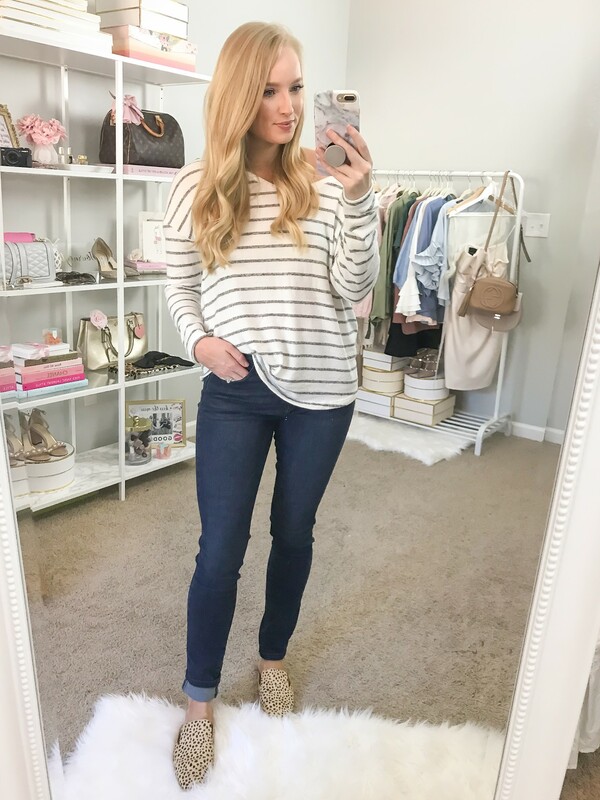 I’m wearing a small here and paired it with denim skinny jeans (wearing size 6). This leather handbag comes in 4 colors and looks more expensive than it actually is. I love the detachable cross body strap and gold accent details. You can see it a little better in the try on video at the end of this post. These jeans are very dark wash, almost too dark that you can’t see the fun ankle detail which is why I picked them up. The material isn’t my favorite. I’m wearing a 6 and it feels tight in some areas but baggy in others. I think they look better and lighter online than they do in person. I picked up two basic tees while they were 2/$14 and this color is my favorite. It’s a pretty contrast against denim and I love it under my olive vest (similar here). The slide on booties are really fun and I’ve seen more expensive versions in store. I think this is a trend that you will be seeing a lot this year and even more next year. Size up at least a half-size for extra room at the heel. 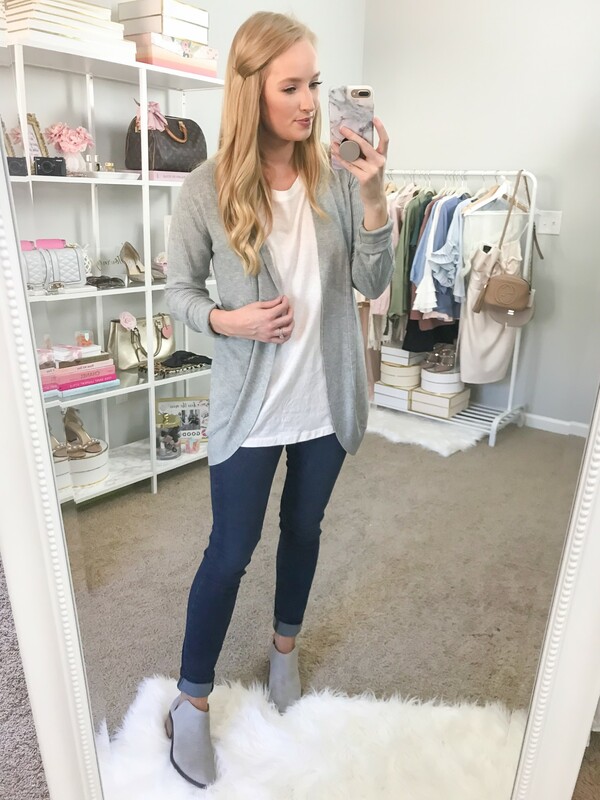 This cardigan is one of my favorites from my haul and comes in 4 colors. It’s soft and the small fits well. Do be careful when putting it on, my ring wanted to snag it a few times! Underneath I’m wearing a small basic top and I love this color paired with the denim skirt. These shoes run big, so I recommend sizing down a half-size. They’re taller than the typical heel height I go for, but they are an almost exact dupe for this Steve Madden version. Unfortunately this sweater is going back because it’s uncomfortable and scratchy, but I love the style and color so I’m on the lookout for one with a better material. Here I’m wearing a medium tucked into this denim skirt with a faux Gucci belt (also featured here). 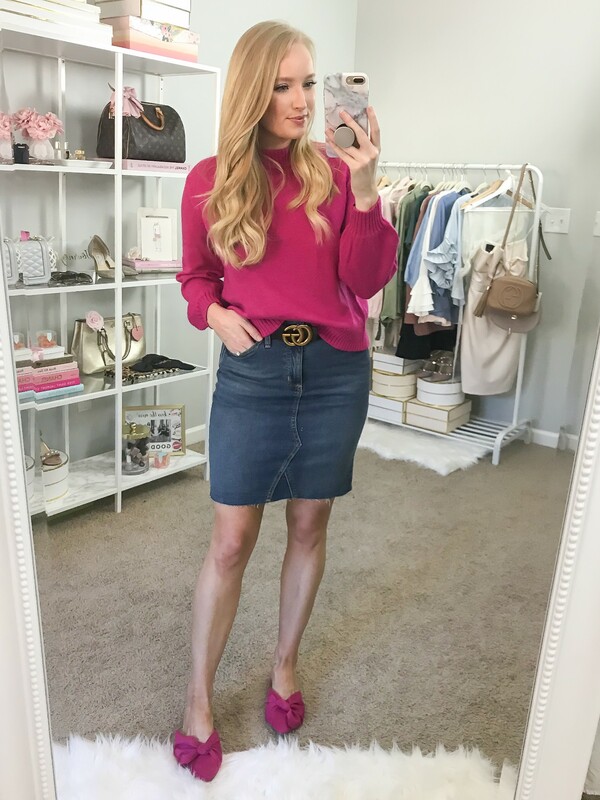 I love denim skirts for Fall and I styled another one here if you’re looking for more inspiration. As for the shoes I’m not 100% sold on the shape, but I love the color and bow detail. Size up so your heel has plenty of room. I styled this dress in my Fall Wedding Guest Dress Guide and here I have it styled more casually with a green basic top knotted over top. 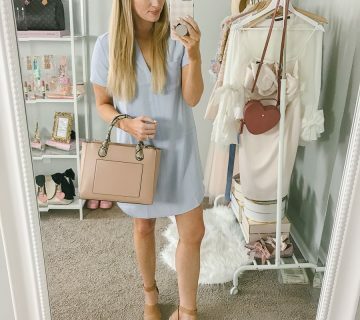 My handbag is featured in my Amazon Fall Try on Haul if you want more details. Its only $35! I get really excited about buffalo check and especially love it in Fall! This poncho is soft and cozy and is perfect for your trip to the pumpkin patch. I dressed it up here with a belt to keep my shape and the same skirt and top featured above. 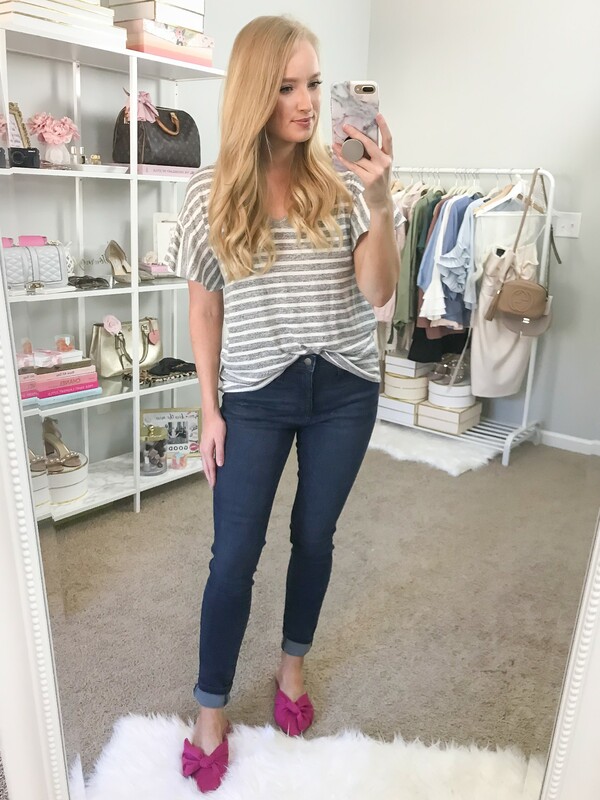 Although I love this ruffle sleeve stripe top, I’m going to return it. It makes my shoulder look broader and I think the medium would be a better fit. This dress in the small is way too tight in the waist on me. I can’t take a deep breath while wearing it. I like the color and print but I’m not a huge fan of the material so I would return it even if it did fit well. I’m working on a Target Fall shoe Guide next so check back tomorrow for a more detailed shoe review. Really love the taupe tall slouchy boots but they don’t fit my calves. I’ve looked around elsewhere but I can’t find anything similar. Have you seen anything that comes in a wide calf variety? I will look around and keep my eyes peeled for you!